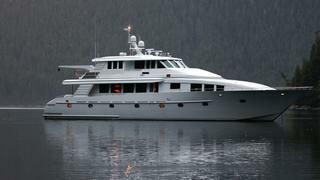 SEYCHELLE may be entered amidships (port & starboard) or through the sliding glass door on the aft deck. Entering from aft into the salon, forward to the formal dining area, forward center to the galley. 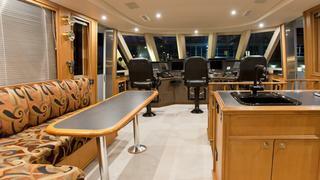 To starboard of the dining area is the entertainment center and entrance to the stairs going up to the bridge. Forward to starboard is the staircase to the guest accommodations, a day head next, and then an entry to the country kitchen settee, which is also open to the galley. Continuing forward to starboard is the curved staircase to the crew area. 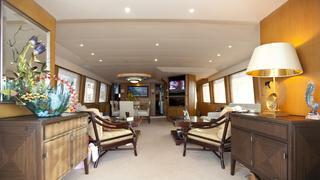 The five owner/guest staterooms are en suite and have queen beds.